Not to be confused with World 2-8, Level 2-8, or Stage 2-8. Area 2-8 is the eighth course of Jumpy Jungle and the seventeenth course overall in Mario vs. Donkey Kong: Mini-Land Mayhem!. 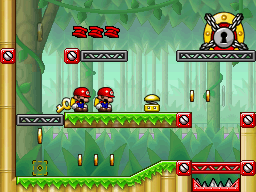 The level features two Mini Marios, including one with a key. The Mini Marios begin on a platform over on the middle left, with the exit door to the top right. In order to reach it, the Mini Marios must swap positions, then jump from the center Long Spring to reach the door. The M-Token is located at the top, atop a Red Girder platform next to some Girder Pickup. To collect it, the Mini Marios must simply turn around and use the center Long Spring to reach the top left platform. The Mini Mario Card is located at the middle right, atop the Red Girder platform above the one over a Spike Trap. The Mini Marios must simply approach it from the left.